I just read two stories from the end of 2007 just before the start of the financial crisis. The Torygraph like a number of other newspapers ran a story pointing out that personal debt for the first time exceeded GDP. Around the same time the BBC ran a story by Michael Blastland and Andrew Dilnot pooh-poohing the scaremongers. 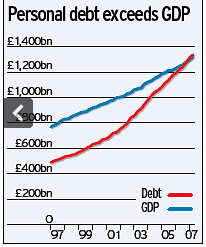 It’s true — there’s nothing sacrosanct about the 100% personal debt: GDP figure. It doesn’t really matter that the economy can’t generate enough wealth in a year to pay off personal debts because this isn’t something that’ll ever have to happen. But the Beeb was wrong to suggest that “rising debts are an indication of rising ability to borrow, resulting from rising wealth”, because wealth itself is partly a function of debt. The inevitable deleveraging would weigh on the economy. One of the overall conclusions is that the rising number of bankruptcies “do not indicate a national crisis, and they do not show that debt is bad.” Correct, but the overall thrust of the argument couldn’t be more wrong, and the timing — October 2007 — is ironic, because it presaged the entire debt-driven collapse of lending markets which precipitated the crash and the great recession. A trillion dollars of debt does matter, and the country’s well-established ‘buy-now, pay-later’ culture is a problem, even if in a slightly different way to what Thornton suggested.